"Push on the left rail to go left" "Lean forward to go faster" ?? I hear beginners say "I want to turn my surfboard" and "I want to go faster on my surfboard". I hear some instructors reply "Push on the left rail to go left" and "Lean forward to go faster". Well, that's technically not wrong, but it's not that simple. Dropping down, setting up for the bottom turn. 1) hands are neutral but ready. 2) Eyes looking down the line and to where to turn off of. 3) Feet are in the proper 3 o'clock for the back foot and 1 o'clock for the front foot. 4) Body is coiled but not squatting. 2) Back (Drive) arm comes forward and across the chest. 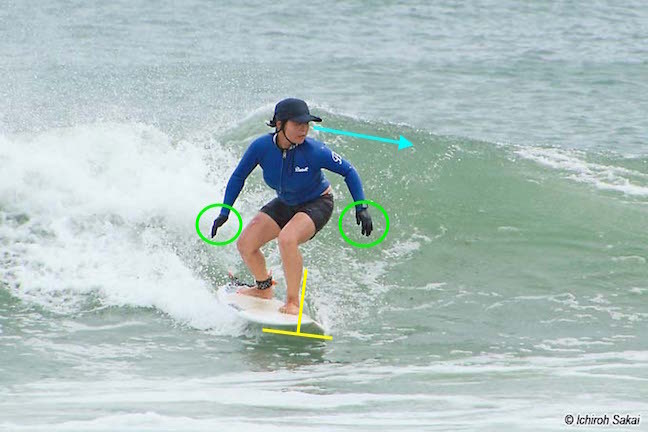 3) Shoulder, torso and waist twist into the wave. 4) She is turning AND leaning, not just turn, not just lean. 1) front arm rips back down and back. 2) Body line still strong and inline with the deck. 3) Turn is made not too far out on the shoulder and not too close to the curl. 1) So she pauses her action. Hands in neutral position. 3) Eyes down the line and waits for the wave to stand up and run again. 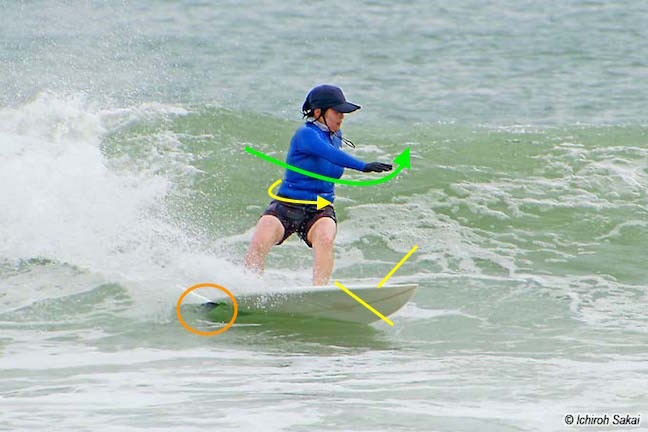 4) Keeps her head over her feet, BUT knee is angling forward to push weight forward. Then at the right time, twists the body and brings the back arm forward across the chest. 1) back arm comes around. 2) front arm down, but acting like a pointer to a pivot point for the board to turn on. 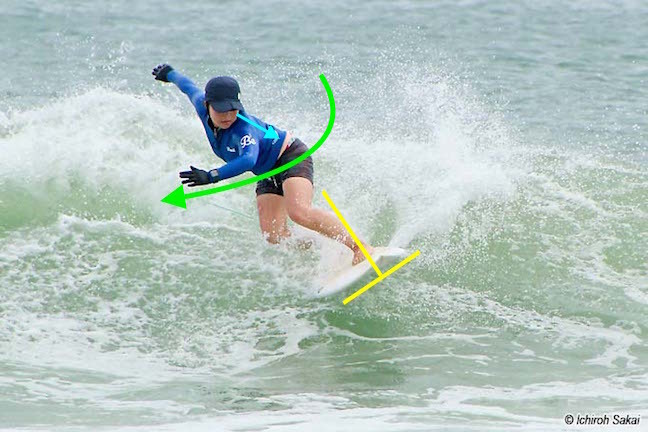 3) Front toes come up to take power away from the front and GIVE power to the back foot which is over the fin(s) and to help with the twist. 4) Bodyline strong and inline. One turn made out on the face. Now the second turn in the pocket to get back again. 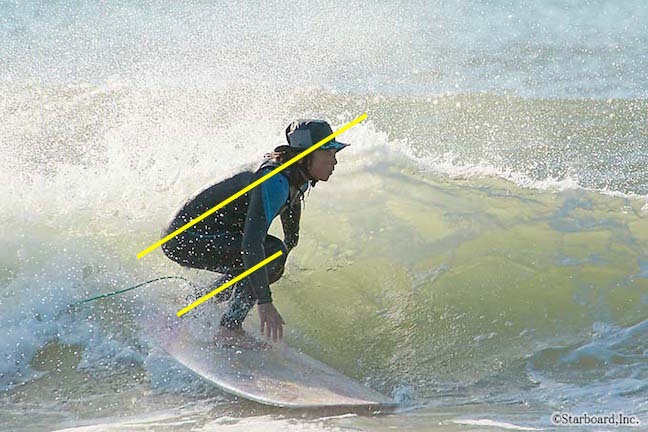 1) Body starts the roll from outside rail back to inside rail. 3) Back hand is in neutral position. 2) Gets her head over her front foot. 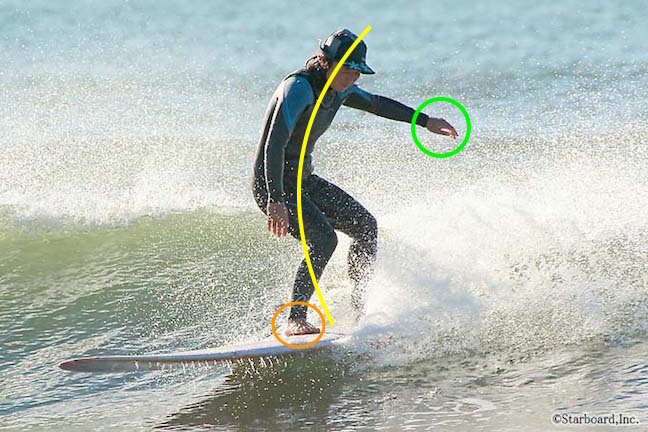 4) Body line is angled forward but still stong over the feet. Not leaning over the rail either way. 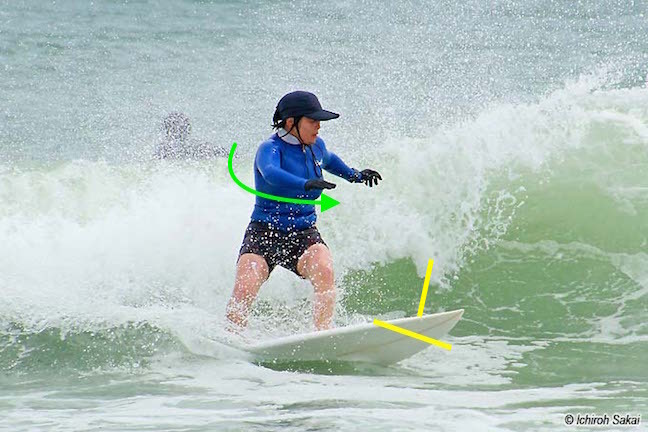 So yes, pressure the left rail into the wave when going left and the body goes forward to speed up. BUT .............it's not that simple. 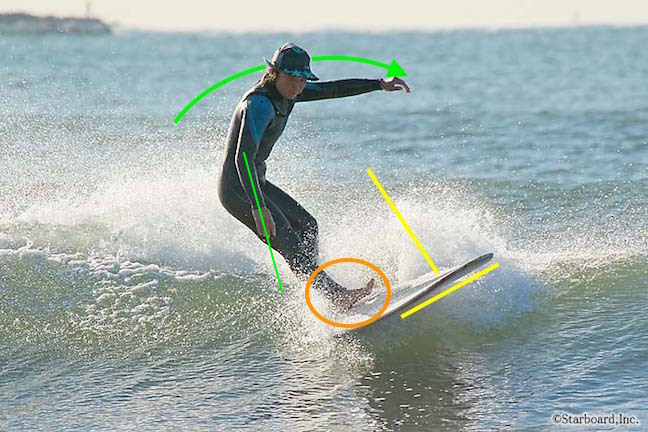 Boards slow down in turns, so you will soon need to speed up. ( and you just can't keep turning one way, sooner or later you need to turn back ). Plus you can't go forward too early ( or too late ). You need to see and listen to what the wave is doing. You may know how to pressure left and lean forward. 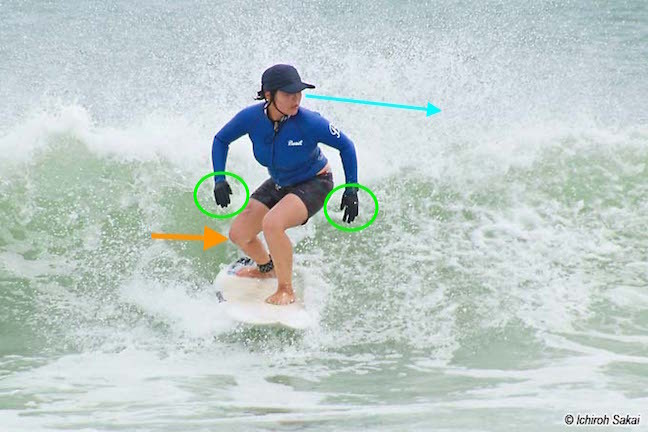 But good surfing is knowing WHEN and WHERE to turn, speed up and slow down.